Samsung has made its Internet Browser app compatible with some third party devices. The mobile app, which comes pre-installed on the South Korean company's Phones and tablets, is for the first time available for non-Samsung devices. 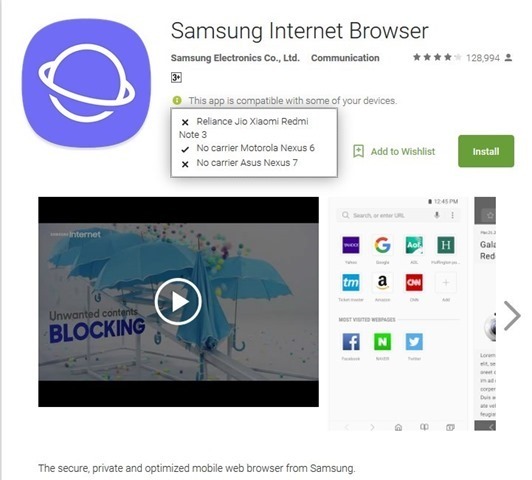 According to a report, the Samsung Internet Browser app can now be installed directly from the Google Play Store, on Nexus and Pixel devices. This is actually mentioned on the description on the app's listing. Some reports however suggest, that the app is compatible with devices from other companies like Huawei too. While we cannot confirm it, we can say for sure that the Samsung Internet Browser works on our Nexus device. If you want a privacy centric browser which uses DuckDuckGo for search, and offers ad-blocking without root, thanks to the Disconnect.me content blocker, you may like Samsung Internet Browser. Ig you want better content blockers you may want to check one of the following apps, which are also available from the Google Play Store.